Rowes is proud to be associated with Sealy Posturepedic. Our SLEEPLAB has one of Toowoomba’s best displays of bedding, featuring a large range of mattresses and ensembles ranging from the inexpensive to the very finest bedding in the world. 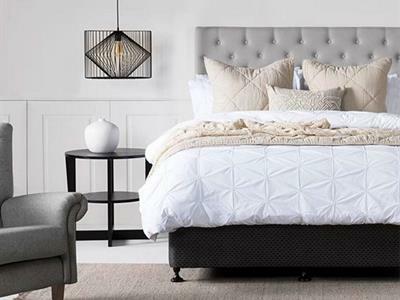 The Australian made Sealy range, manufactured in Brisbane, allows Rowes to offer a fast turnaround for orders, meaning you can have your dream bedroom sooner. Our long serving staff have been expertly trained and understand the importance of listening to customers’ needs and matching those with the correct mattress to achieve the best possible sleep result. Rowes purposely provide a friendly, no pressure showroom to allow customers to take all the time they need to feel they have made the best choice for their bedroom. Rowes is part of one of Australia’s largest buying groups…FURNITURE ONE incorporating SLEEPLAB. When combined with over 100 years of the Rowe family retailing in Toowoomba we can ensure we are genuinely in a position to offer a deal that won’t be beaten. Our after sales commitment to our customers is second to none…. beginning with our own trained careful considerate delivery staff, we will ensure your mattress will be delivered on time without fuss and SET UP in your home…we are also able to take away your old mattress. Rowes has been in business for a long time and continues to trade based on old fashioned family values with no gimmicks. We also offer competitive finance with the very best prices. Visit our SleepLab to discover how you can have the best night's sleep. Together, we can help you find the perfect mattress for your body. In the course of a lifetime, you spend more than 220,000 hours in bed – far more time than you spend on the sofa, at the kitchen table, or watching TV. No other piece of furniture in your home gets as much use as your bed. Good sleep is essential for a happy, healthy day ahead. That’s why it’s so important to find the mattress that is right for you. Here’s are the top 3 things you should look for when choosing a mattress. Comfort : A mattress should be chosen primarily on its comfort. Time should be spent trying all the mattresses in the store, reducing your selection to 2-3 models. A mattress will not be able to be replaced or exchanged because of an incorrect choice, so ensure you spend at least 5-10 minutes on your final selection. It’s always recommended that the person(s) who intend to sleep on the mattress, make the effort to lie down together, to ensure they are happy with the level of comfort the mattress is providing. Support : Correct support is the essential ingredient for a healthy body. A good mattress and base will gently support your body at all points and keep your spine in the same shape as a person with good standing posture. Durability : It’s the quality of the materials used and how they’re put together that determine how long a mattress and base will provide the comfort and support you bought them for. The best assurance of good performance over many years is to buy the highest quality sleep ensemble you can afford. We can help you find the perfect mattress for your body, to ensure a great night's sleep. Visit our SleepLab to try our large range of mattresses, chat with our experts and together we can find your perfect mattress.